The prompt for this fortnight's #2014BloggerChallenge was winter skincare. 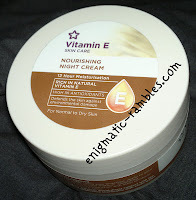 I really like this night cream (full review here) it is a must have product for me in the winter. It works overnight and eradicates any dry patches which I sometimes get during the winter. Also I find drinking water in winter difficult, drinking cold water when it is freezing is not appealing. This is where I find drinking fruit tea useful. It is a hot drink and helps keep fluid levels up which in turn keeps your skin in better condition, when I am dehydrated I find my foundation doesn't apply or lay as well as it should. My favourite is Mango and Strawberry, I do need to try out a couple of the newer blends though. Finally winter skincare would be lip balm, I have a bit of a thing where I can't be without a lip balm in about a foot of me. I always have one on me, and multiple ones in my bags, coats, pockets etc.